1. Going into 11:20, look at the 1 hour trend. If it is up, the trade is a sell. If down, it is a buy. If not clear, do not trade. Trail an entry stop 3 points from price. 2. When elected, trail an exit stop 3 points from price. 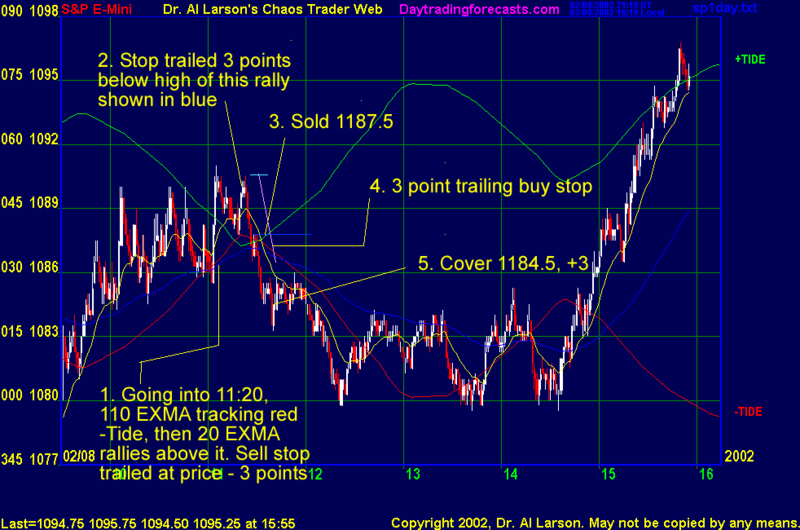 The trailing stop entry is an alternative to using the tracking EXMA's. It's a simple mechanical entry technique that works over time. But it requires greater timing accuracy than using the tracking EXMA's. In this case, using the tracking indicators to stay in the trade longer, and using a less aggressive stop technique, would have done better, maybe 6 points. But HINDSIGHT is great. And it's all "woulda, shoulda, coulda." The MoonTide forecast gave FORESIGHT, from which we formulated a plan, and we executed that plan. So there is no shame in settling for 3 points. Changes in the planning can be done on the next trade.